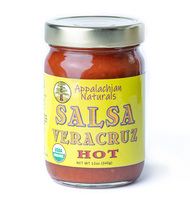 Hot Salsa from Goshen MA! It's: sugar-free, vinegar free, low sodium, low fat, certified organic, and made from locally grown ingredients. Can't go wrong! This salsa isn't super spicy, it's moderately spicy. Product is gluten free but not from a certified facility.